Antwerp, Vrients, 1601. 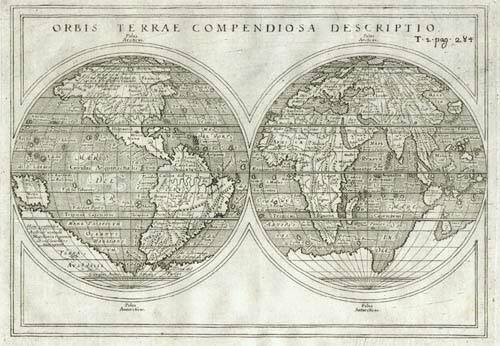 When Vrients published his first edition of Ortelius's Epitome he introduced this new double-hemisphere map, alongside the original oval map engraved by Galle. 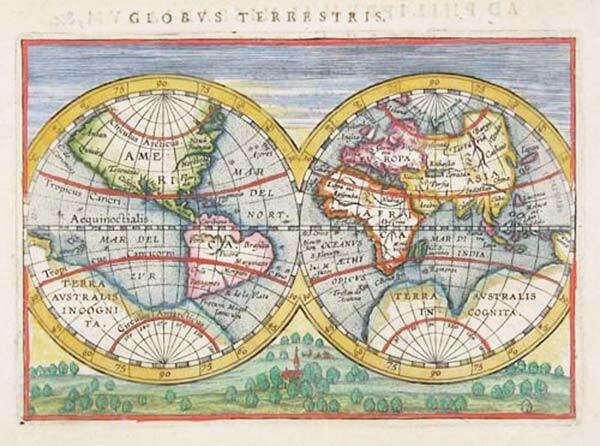 It is untitled, although there is 'Globus Terrestris' in letterpress above the map. Under the spheres is a rustic scene, with a church in the centre. Paris, 1683. 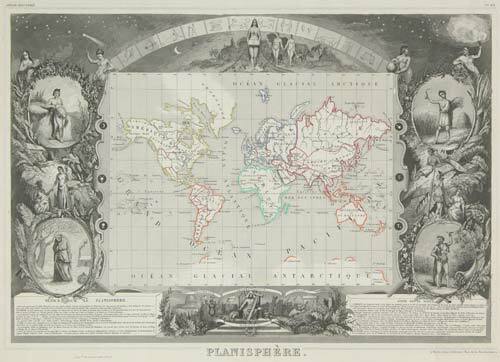 A pair of hemispheres, the west with California as an island and the unnamed partial outline of New Zealand, the east with the parts of Australia. Published in Mallet's 'Description de l'Univers'. Paris, 1705. Double-hemisphere world map with California as an island, decorated with roundel portraits of nine explorers, including Columbus, Vespucci, Magellan, Marco Polo & Drake. Early mapping of North America with the Great Lakes in outline. Venice, Lasor a Varea, 1713. Double-hemisphere world map. Copenhagen, Jonge, c.1760. 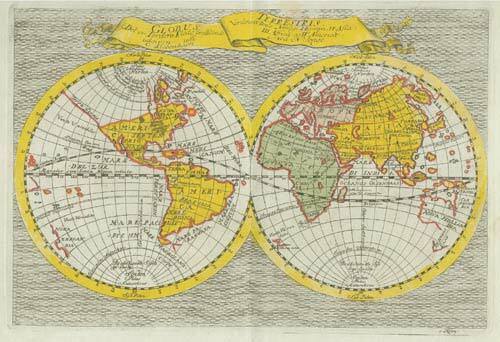 Double-hemisphere world map, with the title on a banner. Paris, c.1775. 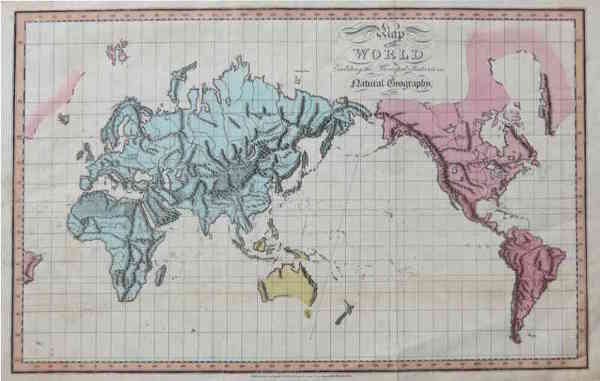 A large chart of the world which, although it is dated 1748, has been updated to show the discoveries of Captain Cook around Australia and New Zealand in 1769-70. 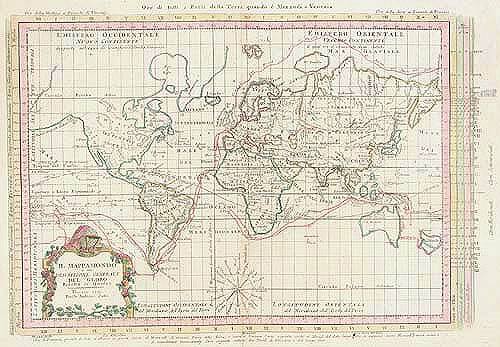 However Cook's discoveries through the Bering Straits on his Third and final voyage (1778-9) are not included. Rhumb lines, two compass roses and an ornate cartouche make this a very decorative map. Paris, c.1790. Pair of maps showing the prevailing winds between the tropics of Cancer and Capricorn, with the seasonal directions of the Monsoons. London, 1795. 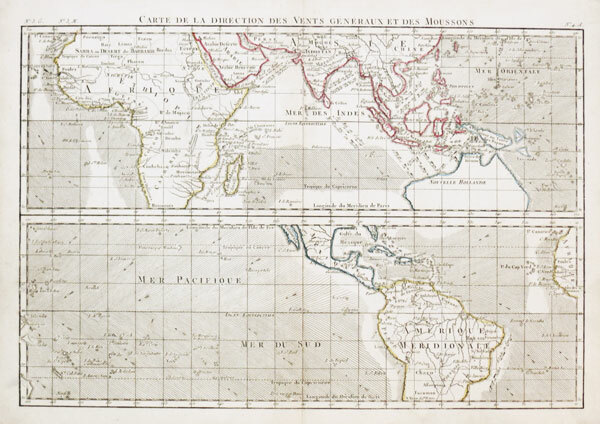 A world map showing the routes of Cook's three voyages. Tasmania is shown as part of mainland Australia. Venice, 1795. The world on Mercator's Projection. Despite the date of 1795 and the inclusion of the route taken by Cook in his first circumnavigation, the coastlines of New Zealand and the Bering Straits have not been corrected. London: Sherwood, Neely & Jones, 1809. A map showing the mountain ranges, including Rennell's infamous 'Mountains of Kong' in Africa. Edinburgh, 1816. 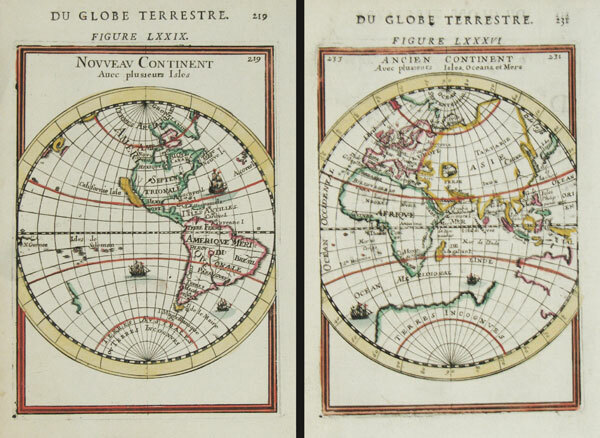 Maps of the Western Hemisphere & Eastern Hemisphere. Paris, c.1850. 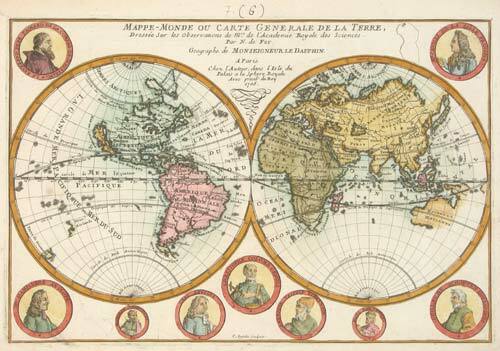 The World on Mercator's Projection, with ornate vignette borders. Edinburgh & London: William Blackwood & Sons, 1856. 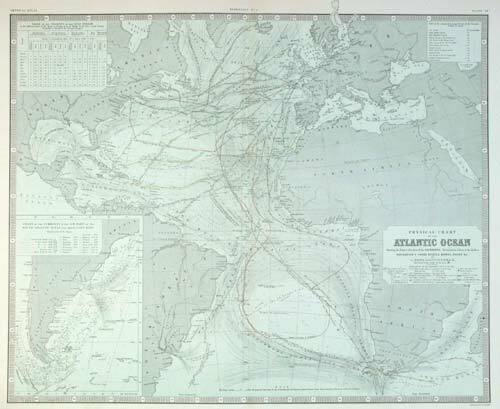 A facinating chart depicting the difficulties in navigating the Atlantic, with the currents and winds making a direct route impossible. The routes of many famous voyages are marked. Paris, 1683. The Eastern Hemisphere, with Australia connected to New Guinea. Published in Mallet's 'Description de l'Univers'.